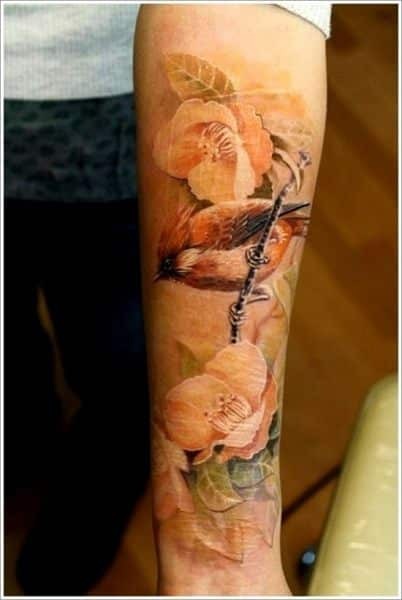 Birds have been the hot favorite choice for tattoos for many years now and the tattoo world has favored all sorts of birds. Just the way chirping of birds can lighten one’s mood and signifies the dawn for new opportunities and possibilities, bird tattoos basically symbolize freedom and the ability of a person to spread his wings and fly away, break away. They are powerful indications and metaphors to human emotions and various phases of our life. There was a time when only fishermen and sailors sported bird tattoos but with the advent of time, bird tattoos have gained increased popularity among men due to the intricate designs that they incorporate and the fact that they depict sentiments and emotions and speak for themselves. These tattoos look fabulous on the arm, entire back and shoulders of men. They involve bright colors incorporating a complex intricate design or just a plain simple tattoo focusing solely on the symbolic meaning of the bird. So let’s discuss what does each bird signify and the commonly inked bird tattoos for men. One of the most loved bird tattoo design for men, moreover because of the meanings related to the mythological bird of fire. The phoenix bird symbolizes rebirth, growth and longevity, life, the beginning of something new or some event which will have a great impact on the person. A phoenix tattoo also signifies loyalty. An eagle tattoo is an another common choice by men as it is a majestic bird which signifies spirituality, power, wisdom, masculine strength and virility. Since it is the national emblem of USA, an eagle holds a patriotic and influential place. Military personnel commonly flaunt a bald eagle tattoo as they represent undying strength. Eagles are considered fearless as they are on top of the food chain and have very little to be afraid of as they are the kings of the sky. Eagles represent ultimate freedom, free spirit and fearlessness. They also symbolize the Sun, representing eternal wisdom and enlightenment. Just like the eagle, a hawk is also a bird of Honor and Valor. It is considered as the epitome of Intuition, Foresight and Intelligence and Perspective. Hawk, known for its hunting skills, great vision, focus and concentration to make the kill represents persistent efforts towards achieving one goal. It also has a deep meaning in war and military victories as it represents protection, good judgment, bravery, shrewdness and a sense of spirituality. Hawks are said to be carriers of evil and corrupt souls which represent your ability to overcome these traits. Falcons have very little distinguishing traits from a hawk. A falcon with a rabbit in its clutches depicts victory over lust. Falcons also represents Hope, Performance and new opportunities. Ravens or crows are noble creatures and evil all at the same time. Crows have been a symbol of bad omen since ancient biblical times. They signify creation, renewal, protection, transformation and impeccable intellect, thereby many contradictory qualities all in the same breath. Crows are considered as bearers of death and bad news. Thus, a crow tattoo shows that you have accepted death as an inevitable truth of life and do not fear it. Vulture tattoos are not so common and are flaunted by people who dare to look past the stereotype. They represent cleanliness, patience, renewal, protection, intelligence and the fact that you have survived all the difficulties that life has put forth and have made the best of all the worst things. They are also said to represent motherhood and family. Spectacular bright colors symbolize a sense of adventure and exuberance in you. Since they are birds from the heaven and have sworn to not land on the earth, they symbolize detachment from worldly concerns in a healthy way. They also signify that you believe in afterlife, heaven and have a great respect for your life. Roosters universally signify new beginnings, the rising sun as they welcome each day with their morning calls. They signify courage, vigilance, leadership, pride, bossy attitude and masculine power. Roosters are said to be strong and capable to bounce back from any obstacle or difficult situation. They are also said to be protectors and to have an ability to expel evil spirits. This specific tattoo is deal for any man who wants to embody a good amount of mystery art on them. 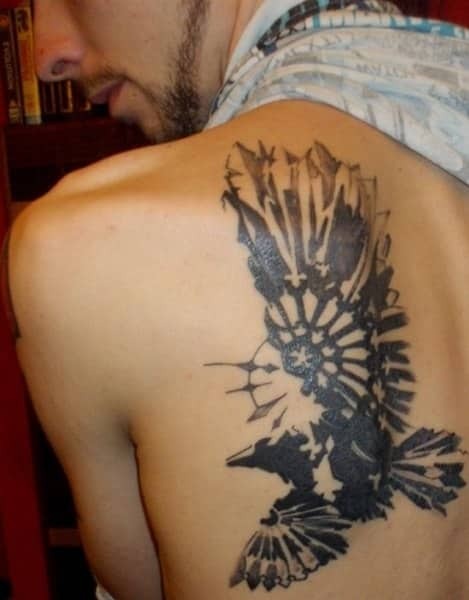 The tattoo is that of a bird which appears to be high up in the air with a lot of detail put into its wings. One wing is larger than the other and they are both shown to be delicately connected to each other using particular sharp edged shapes. 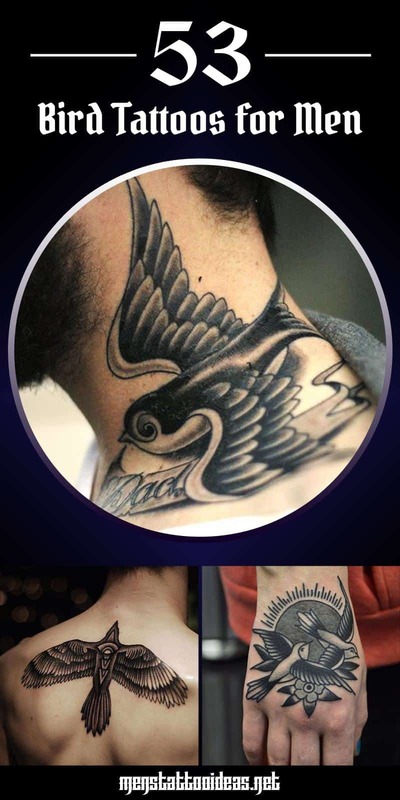 This bird tattoo idea is ideal for the man who wants something simple yet exquisite on their chests. It shows a bird drawn on the topmost and outermost corner of each breast to appear as if the birds are flying towards each other. This specific tattoo idea again is ideal for the guy who wants something simple yet elegant. 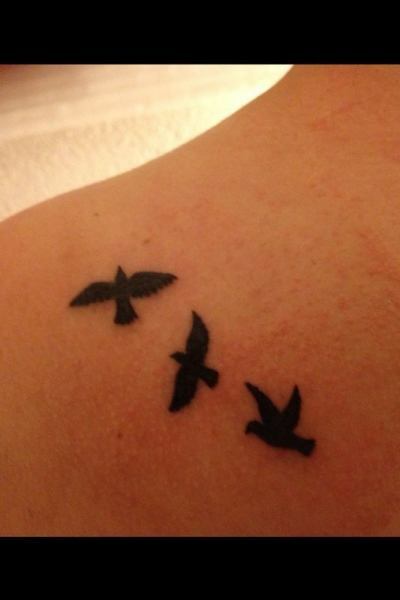 The tattoo is of three little birds drawn on the back of a shoulder to show that the birds are flying towards each other. This again is a tattoo idea for men who want simplicity. It’s a tattoo of four little birds flying away which is best drawn on a man’s shoulder. 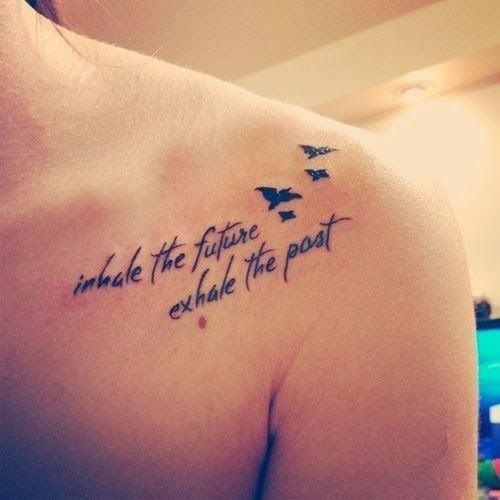 The words, “Inhale the future, exhale the past” are also drawn just below the birds. 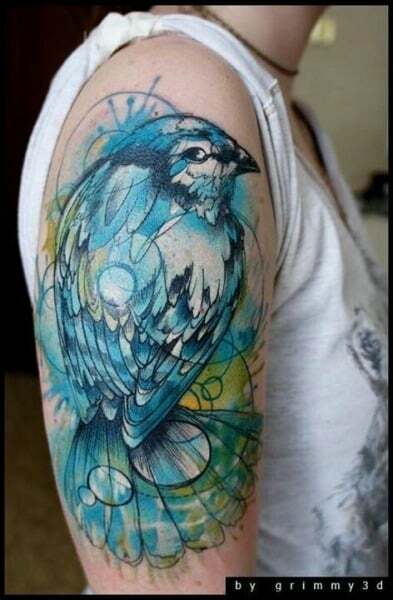 This bird tattoo is one which utilizes colors very well to best bring out its look. 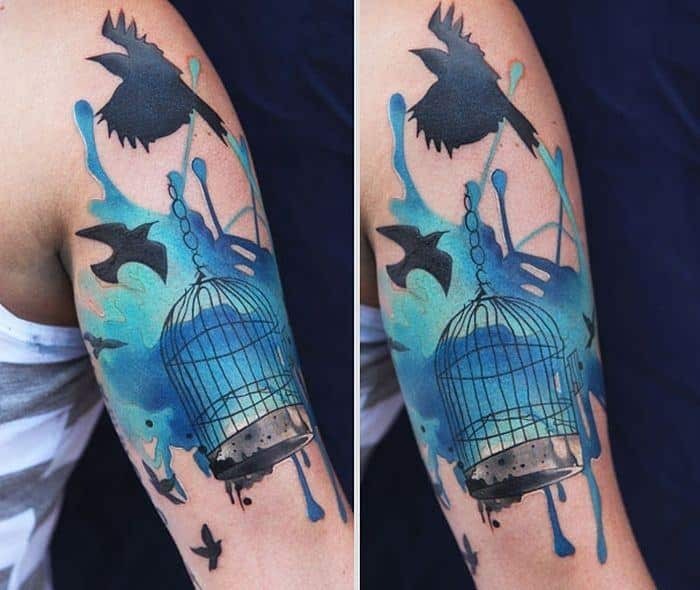 The tattoo is one that shows a cage that appears to be swinging about and some black birds flying around the cage. There is a splash of blue background to the cage and birds. This tattoo idea is one that should be done by men who want something bright colored on them. The tattoo shows some bright red with a slight shade of green colored flowers. In the midst of these flowers is a little red bird perched on a twig. 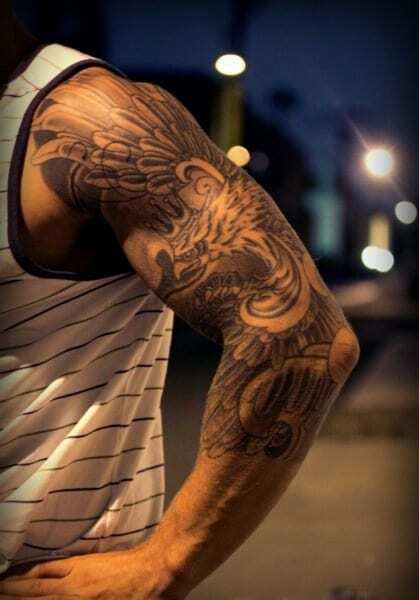 This tattoo idea for guys is ideal for any man who wants something that will stand out on their upper arm. The tattoo runs all the way from the shoulder down the base of their elbow. It is of a bright blue bird with hints of white on its feathers that appears to be perched on the man’s skin. This specific tattoo is ideal for the man who wants a tattoo done on their full arm length. 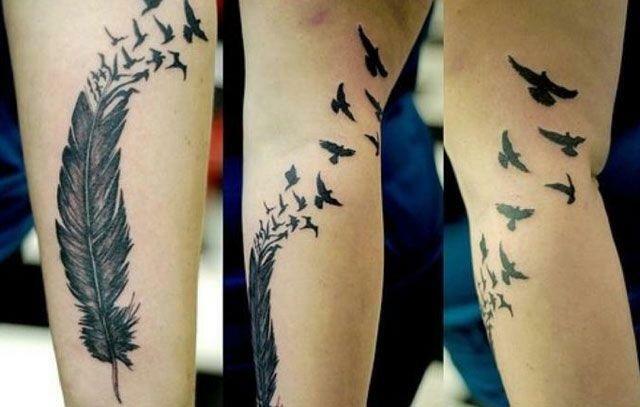 The tattoo depicts several birds drawn at different parts of the arm, flying about. The tattoo also has some words written randomly on different parts of the arm. This is an ideal tattoo idea for the man who wants a tattoo of a bird on their entire upper arms and part of their lower arm. The tattoo is of a bird with a crown on its head that appears to be flying away. This tattoo design shows a large black single feather. The tip of the feather disintegrates to show little black birds flying away from the feather. The birds appear to increase in size as they fly further away from the feather.